The City of Albuquerque Parks and Recreation Department is teaming up with the Family and Community Services Department to launch Family Nature Clubs that will inspire more Albuquerque families to get out into nature. Family Nature Clubs are a model of engagement designed and led by the Children & Nature Network. The City of Albuquerque Open Space Division, the Department of Family and Community Services, and other early childhood partners are coming together to present this program Saturday, March 23 at the Open Space Visitor Center at 1:00 p.m. The Family Nature Clubs are an exciting model that encourages families to foster exposure to nature and outdoor play that research shows makes for a happier and healthier family. Families are invited to the Open Space Visitor Center for family-oriented activities and a presentation to learn more about the program and future Family Nature Club events for families to attend. 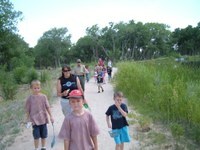 Family Nature Club events are free to anyone who would like to participate! In addition to the Family Nature Clubs, the Open Space Division will also be hosting Family Nature Walks at the Open Space Visitor Center beginning in April. These FREE family-friendly nature walks will provide opportunities for families to connect with nature and enjoy several walks varying in difficulty from easy to moderate. Participants will learn how to use binoculars, loupes, and field guides. All of these hikes will begin and end at the Open Space Visitor Center. Participants must register at play.cabq.gov or call 505-452-5200. Saturday, April 19, 2019 10:00 a.m. – 12:00 p.m.
Saturday, October 11, 2019 10:00 a.m. – 12:00 p.m.
Saturday, November 27, 2019 10:00 a.m. – 12:00 p.m.
About CABQ Parks & Recreation: The City of Albuquerque’s Parks and Recreation Department is responsible for maintaining nearly 300 parks, 143 miles of multi-use trails, more than 29,000 acres of Major Public Open Space, four municipal golf courses, and numerous aquatics and recreation facilities throughout Albuquerque. Hundreds of employees across seven divisions within the Department take pride in ensuring Albuquerque residents have great facilities to foster a vibrant and healthy community.